Here is my video of a wall cloud that developed over St. Landry Parish, b/w Cankton and Sunset early yesterday afternoon. 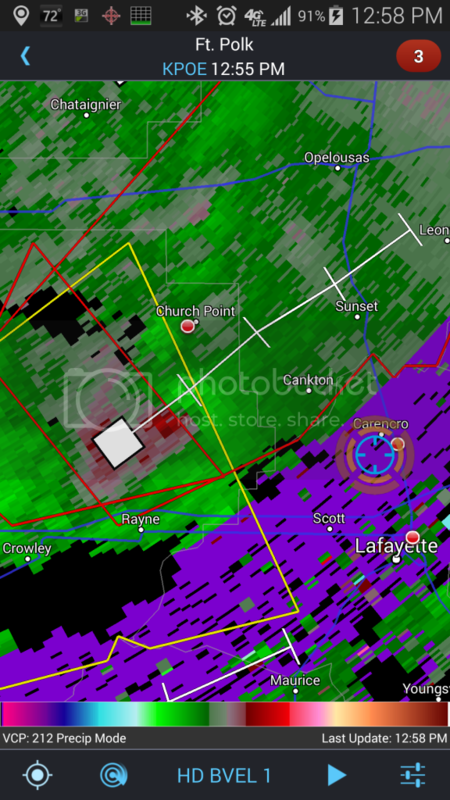 This was in associated with an actively Tornado warned storm. Didn't observe any rotation at the ground or damage, but there was at least one report of damage in Sunset assoc. with this storm. NWS in Lake Charles has not confirmed any tornados yet with yesterday's severe weather. MOVING NORTHEAST AT 30 MPH. INTERIOR ROOM OR HALLWAY ON THE LOWEST FLOOR AWAY FROM WINDOWS. TO SEE OR HEAR IT COMING...IT MAY BE TOO LATE TO GET TO A SAFE PLACE.